Now that I have cleared the main types of listening (background, passive and active listening), it’s time to look at something which is common to all of them: listening speed. This is a concept I think is both simple and useful. I have talked about it briefly in the article about problem analysis, but apart from that I haven’t found any references to “listening speed” in the sense I’m using the word here on the internet. I don’t say I’m the first or the only one using the word like this, but I hope this article will increase awareness of the phenomenon and its importance for improving listening ability. In short, listening speed is the speed at which you can understand spoken Chinese. In this article, we will look closer at the first two in order to understand how we can achieve reading speed. Phonological awareness is simply knowledge about the sounds of Standard Chinese. The sound inventory is relatively simple compared with some other languages, because Chinese doesn’t have that many different syllables (about 10% of the number in English), but that doesn’t mean it’s easy to learn. Some sounds might not exist in your native language (zh/ch/sh, z/c/s for example) and many learners feel that these are difficult to distinguish and/or pronounce. The same is true for tones. Being able to distinguish all syllables from each other is the most basic skill we need in order to understand. The first of these two is what people mean when they say “I know this word”. However, as we shall see, I think how fast you know that word is of paramount importance for listening ability. This is what I call listening speed. Next time I encounter this sound, tīng lì, I might or might not remember its meaning. If I do remember it, the recollection is probably not instantaneous; let’s say it takes me five seconds to search my mind and come up with the correct meaning. (The figures I’m use here are wild guesses and are merely included to illustrate my thoughts.) Next time I hear this word, the recollection will be quicker, let’s say it takes two seconds. Then one second. Gradually, as our brains get used to connecting the sound with the meaning, the process is completed more and more quickly. Assuming that we can distinguish the sounds used in Chinese and that our vocabulary is broad enough, we should be able to understand anything said to us in Chinese, and if we just know enough words we should be able to pass the listening test on the advanced HSK, right? Even if you understand all the words, your parsing of the sentence and it’s meaning might be too slow. If the speed at which you process the audio you hear is slower than the rate of speech, you will have a problem. By my own non-scientific estimate, news broadcasts are typically read at a pace of 3-4 syllables per second, which gives something like 2-3 words per second. Thus, if you require more than half a second to understand what these words mean, you will get lost very quickly. This is of course a crude example and the actual speed required is faster than that, because you not only need to understand all the words, you also need time to understand the sentence as a whole and how it related to the topic in general. I think the solution is very simple indeed: Listen as much as you can. Each time you hear a word you understand, the time required to retrieve that word will decrease. If you’ve learnt thousands of words in Chinese, you need to listen a lot before you’ve heard all those words a significant number of times. Before you have, you will continuously run into problems with listening speed. Note that you have to understand what you hear for this to be effective. You’re training your brain to link e.g. “tīng lì” to the meaning of “listening ability”, but if your brain can’t make the connection, it doesn’t count (it might still be good for practising other things, though). A very simple solution is to use an SRS which is capable of reading all the words for you (Anki, for instance). For the purpose of listening speed, it’s of course better to have the audio on the front of the flashcard (as part of the question), but if that doesn’t work with how you’ve set up your cards (let’s say you’re testing yourself on the pronunciation of characters), you can still add the audio to the back of the card (as part of the answer), which means you will still hear the sound each time you review the card and can associate it with its meaning. Listening to the words in context is of course even better, but SRS is a very good start and an excellent complement. The more you listen, the better. In this case, it doesn’t need to be very advanced or hard, just listen as much as you can. Listening to the same audio more than once is fine, but don’t overdo it, because the brain is very good at learning context, which means that you might understand words only in the context you’ve encountered them, but not in others. Thus, the best way to improve listening speed is listening to audio you can understand and do it a lot. This is the main reason why I think passive listening is so important! Without it, our brains would simply not be able to parse audio quickly enough to allow us to understand the meaning behind the sounds. 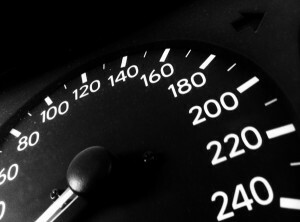 Good article, yeah listening speed is an important part of study and fluency in Chinese. What i find more and more difficult is the dialect Chinese which occupies such a large place especially in Shanghai. For instance, I had to speak with three people tonight (just eating some 烤肉 around the street). The first one was from Xinjiang, the second from Zhejiang and the last from Henan. Their accent was actually different and even if I’m accustomed to Shanghai way of speaking Mandarin, it’s still hard to jump (even some of them had to repeat to others). What I find particularly difficult is then not to listen and understand but much more adapting and building my own “Putonghua”. It’s so weird, when I’m buying cigarette I’d use the Shanghainese Putonghua whereas when I’m meeting Henan people, I can’t just help but to sort of “copy” their way of speaking right after when I’m answering even if my level is acceptable. It’s been a while I’ve been to Beijing but it would be sure that the way to speak would transform me to speak 儿语 in a few weeks. Listening speed is also quite a big problem as the massive gap of “real Chinese conferences and broadcast TV” won’t know that you are a foreigner and hence not make any difference. It’s usually the case when you’re talking to people. They eventually use at most “intermediate ++” for adressing to me. It feels safe and understandable but somehow makes your listening speed to a climax when speaking/listening “normal and everyday stuff” and getting you lost when they’d meet other friends. They often do not use many proverbs or rare sentence patterns. Thus, the listening speed is getting good for “contextual listening” but not wide enough for “skilled/contextual specialized” patterns. Long comment, and yes, the best way to improve is to listen more and more (and learn Shanghainese maybe ^^). Thanks for your article. I think what you say about dialects is crucial and it’s actually something I have an article planned for. Even though Chinese sounds are relatively simple, they still come in a lot of varieties depending on where the speaker comes from. Thus, even if we can understand people perfectly in one area, we might have have difficulties with people from other parts of China (assuming that they speaking Mandarin). I have experienced this over and over. I meet someone new (or listen to a new person on the radio) and feel depressed because I can’t hear what they say. After getting to know them, I understand everything they say. This is not because my Chinese has improved as such, but because I’m used to their voices and dialects. Thus, listening ability is very much about being used to different dialects and voices! I’ve been noticing that listening is a lot better if I’m in a state which is confident, relaxed and alert. So far, I haven’t really been able to achieve that state in conversation (too much performance anxiety) but I often get there when I’m watching dramas on TV. I think what’s happening is that my conscious mind is getting out of the way and letting the assimilative part of the brain pull the story line and the dialogue together. It’s a very cool feeling when it happens. I can relate with what you said about improved listening skills when one is confident and relaxed. Somehow I could understand things better when I’m not trying as hard. Personally, I feel that the conscious brain works too hard when I’m not relaxed. It’s processing the information and worrying about getting it right all at the same time which leads to frustration and headaches. Nice post Olle. I’ll check the audio component of Anki out as well. I agree, this is very interesting. This is the state we want to be in when sitting an exam, but this is of course even harder than doing it everyday life. I remember taking the advanced TOCFL in Berlin last autumn. I knew the listening would be the hardest part and was really nervous. I think I missed a few points simply from not being able to relax at all the first few minutes. I might have lost even more points later, because even though I got more and more into the exercises, I couldn’t relax at all. Tests are a very special kind of situation which isn’t necessarily related to what we do normally. Yes, examinations are indeed a perfect example of this. I have experienced that as well. The worst part is when your frustrations from ones you missed early on carry over to the succeeding questions, it creates a compounding effect that is hard to get out of. I agree completely, I remember tests when the previous question was audibly still echoing around in my head. Then you find yourself in the middle of next question without even knowing what it’s about. Parsing speed is very, very important, becaue if you don’t have that, you will fail even if you know every single word, phrase and grammar pattern used on the test. I’m surprised you didn’t mention the audio function on Anki. I’ve found it a very useful way to put listening speed practice into my anki reviews. I can tell whether it takes me half a second or 5 seconds to identify the word in the audio, and after each review the time gets shorter (unless a word isn’t sticking in my mind for some reason). Of course, it depends on how large the audio deck it – if it’s a small deck, then your brain will learn the context, but the larger the deck, the less your brain can identify the word based on context. There are some pre-made Mandarin-audio decks for Anki which I have found useful. I admit that I haven’t made any of my own Mandarin-audio cards because making an audio card takes more time than making a non-audio card, though I am in the process of building my own Hakka-audio deck because a) I think that having the audio is really important for my Hakka deck and b) there are no pre-made Hakka decks. This article is bang on the money. Another problem that isn’t quite related to dialects: if you’re trying to get standard Taiwanese Mandarin, most of the recordings generally available are in mainland Mandarin, and are stuffed full of neutral tones. The result? It’s hard to get examples with non-neutral tones, which woudl help in learning words.